There were 854 domestic recoveries of tagged Monarchs in 2017. These would be the ones who didn’t make it to Mexico. From the 100 that were tagged and released by members of Loving Garland Green in the fall of 2017, only one domestic recovery was made. We are hoping most of the others made their way to Mexico. I look forward to reading the reports of recoveries from Mexico. For now the Monarch Watch tagging database is down. 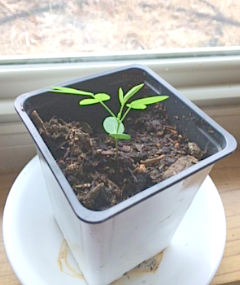 NOTES: monarch was on the ground, seemed stressed, not able to fly/climb, Found on Canterbury Dr.
Wild Senna –among the seedlings I’m growing for our April seed sale at the Garland Community Garden. Wild Senna is an uncommon plant in most butterfly gardens—yet it is nonetheless a great plant. It is a shrubby perennial that grows to be 3 to 5 feet tall and produces lovely bunches of yellow blossoms from July to mid November. Pollinators love it—especially our native bees. Senna is also an herb that is the active ingredient in Ex-Lax. According to the Monarch Joint Venture-- a national partnership of federal and state agencies, non-governmental organizations, and academic programs working together to conserve the monarch butterfly migration—now is the time to begin planning your 2018 habitat projects. Now is the time to plan your 2018 habitat project or Monarch Waystation planting. Monarch Watch is taking pre-orders for milkweed purchases through the Milkweed Market. 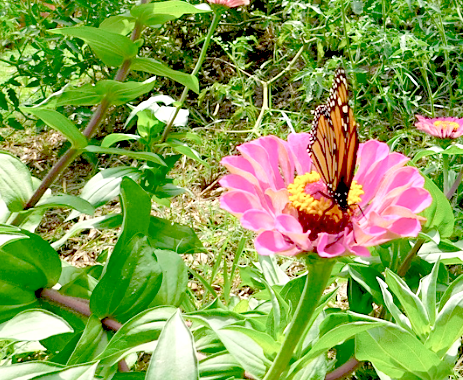 Most species are $74 a flat of 32, and Texas species are $93.50 for a flat of 50 plants. (Purchases are made at time of pre-order.) Share a flat with another gardener, or use the plants as a fundraiser. They can resale for up to $5 a plant! These are restoration-quality plants that are trimmed prior to shipping, and because they are pesticide-free, they may carry aphids. Delivery is expected to begin to most locations in early May and to Texas in April, depending on weather. Today is going to be a beautiful day. I hope you are able to enjoy it.